MADE IN ABYSS: Wandering Twilight will premiere at Anime Central in Rosemont, IL, on Friday, May 17 at 8:30 p.m. Sentai Filmworks and Anime Central have teamed up to host a red-carpet event for this final film in the MADE IN ABYSS two-part compendium series. Picking up where MADE IN ABYSS: Journey’s Dawn left off, Wandering Twilight continues the adventures of plucky cave raiders, Riko and Reg, as they confront the mysterious Abyss where sheer excitement and discovery are equally matched by looming danger and certain death. The film includes exclusive content and scenes available for the first time only on the big screen. 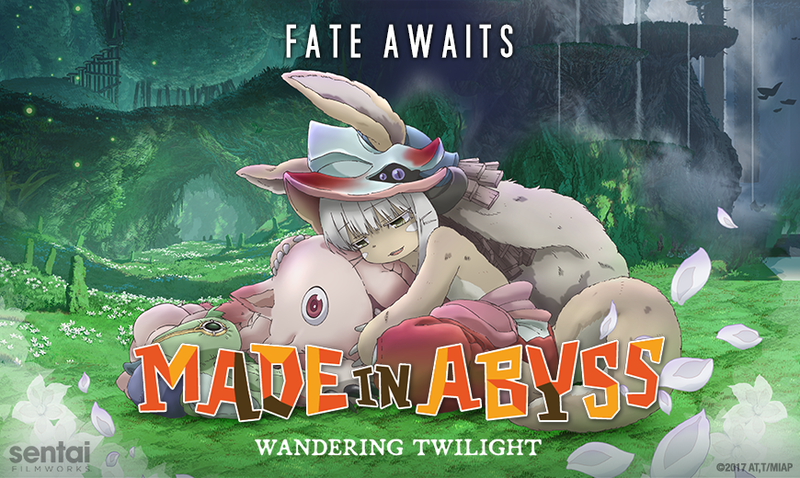 MADE IN ABYSS: Wandering Twilight follows Riko and Reg on their adventure through the Abyss, picking up directly after the events of MADE IN ABYSS: Journey’s Dawn. Riko has learned the truth of her origins, and in the process the mystery surrounding her mother’s death has deepened. More determined than ever to travel to the bottom of the Abyss, Riko and Reg leave Ozen’s Seeker Camp and delve into the treacherous Third Layer — and beyond, to depths brimming with supernatural creatures, unexpected allies and deadly enemies. Perilous, poignant and spectacular in turns, this continuation of Riko and Reg’s journey is sure to leave fans of MADE IN ABYSS absolutely spellbound. Sentai Filmworks is a leading global supplier of anime and official anime merchandise, distributing, and curating one of the industry’s most diverse libraries of top trending and classic titles. Offering thousands of hours of content across both traditional and digital platforms, Sentai is dedicated to bringing captivating stories and iconic characters directly from Japan. With hit series that include MADE IN ABYSS, Land of the Lustrous, The Big O, and Akame ga Kill!, Sentai’s catalog continues to grow with new favorites like Sword Oratoria: Is it Wrong to Try to Pick Up Girls in a Dungeon? On the Side, Princess Principal, and FLIP FLAPPERS, as well as classic anime series such as Legend of the Galactic Heroes. For more information, visitwww.sentaifilmworks.com.